This may sound a little shocking at first but in the days immediately after Christmas Apple’s share of the tablet market actually fell by 7.1%. This is, however, a sign that the tablet market is maturing rather than any beginning of the end predictions for Apple. Although still dominant, the Apple iPad’s (all versions) market share fell by a massive 7.1% in the days after Christmas, and now stands at 78.9% according to data from Chitika, a company that sampled “hundreds of millions” of mobile traffic impressions across its ad network in North America only. 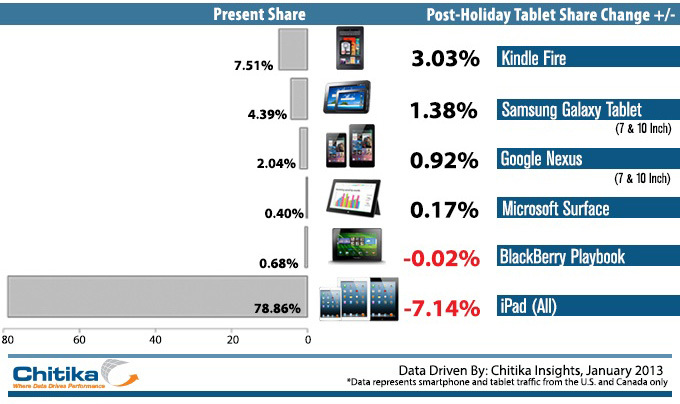 It’s worth noting that Chitika quantifies web share usage across devices, which is very distinct from unit sales figures. Of course, Apple is selling more iPads than ever (although I’ve no hard figures for this holiday season), spurred on by the release of the iPad Mini in November last year. The iPad’s fall in market share is a sign that the tablet market is maturing as competition and consumer choice arrives. This competitive charge is being led by a fleet of Android-powered alternatives (it has also recently been reported how Google is attacking Apple from the inside out). It’s also easy to see how increasingly important Android is becoming in the tablet arena as the top three tablet market share gainers over the Christmas period were all powered by Google’s mobile OS. Amazon’s Kindle Fire tablet recorded the largest share gain over the holiday season, up 3% to 7.5% of the overall tablet market. Samsung’s Galaxy tablet range, Google’s two larger Nexus devices and Microsoft Surface all experienced small share gains. Barnes & Noble had a disappointing Christmas, however, as sales “fell short of expectations” through December, despite introducing two new devices, the NOOK HD and NOOK HD+, in September. The product category that Apple introduced almost three years ago with the release of the first iPad is no longer its own.  Archived in General and tagged Android, Apple, chitika, christmas, google, iPad, market share, sales, tablet. Bookmark the permalink.